Road trips aren’t just for young people looking for adventure. They’re a fun, educational experience that the whole family will enjoy. America’s scenic highways offer a wealth of adventure opportunities, and since gas is more affordable, you can rack up the miles without breaking your budget. If you hear the call of the open road, here are some ideas to help you plan all the details. Wondering where to go and how to prepare? Just follow the guide! California Coastline: You’ll encounter stunning landscapes as you travel from city to city along the Pacific coast. Start in San Francisco, where you can rent bikes, explore Golden Gate Park, take the cable car, and eat like a king. Then take State Route 1, which runs along most of the coastline, to Los Angeles and San Diego. Wind your way through Big Sur and down 17‑Mile Drive, with stops at the Monterey Bay Aquarium, Port Lobos wildlife reserve, and the beautiful Carmel Mission. And don’t forget to snap a shot of the famed Lone Cypress! East Coast: Visit Salem, Boston, and Cape Cod to experience the charm of New England, then head to Cape May and head south as you work your way down to the Carolinas. You’ll love Atlantic City’s bustling boardwalk and the rolling green hills of Pennsylvania—home to the Amish and Hershey’s chocolate. Continue to Virginia and its endless beaches and enormous amusement park, then soak up the historic charm of South Carolina. Route 66: This legendary highway that once stretched from Illinois to California has been decommissioned and no longer appears on maps, but if you carefully plan your trip, you can still travel on some stretches. The east-to-west route is steeped in cowboy lore and Native American history. It’s a long way from the cypress swamps of Oklahoma to the Grand Canyon, to the Missouri plains, but both young and old will absolutely love the experience. For a successful road trip, you need to be well organized. Most importantly, don’t over pack. If necessary, bring a compact, lightweight stroller. For your health needs, take the bare essentials, since you’ll have no problem finding a pharmacy nearby. Most American campgrounds are similar to what you are used to, so find out what activities are available and bring board games for rainy days. Take advantage of bad weather to book a hotel room and wash as many clothes as possible. Kids make great navigators. Show them how to get their bearings and make calculations—handy skills they’ll be able to use for the rest of their lives. 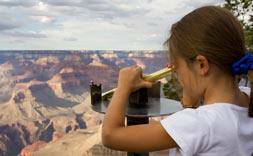 To keep your children busy while traveling between destinations, have them describe sights they’ve seen with words and photos. If you are taking your own vehicle, have it inspected before you leave. Get the latest highway information and take out travel insurance for the length of your stay. Download the free Travel Assistance app so you can contact Blue Cross in an emergency and travel with peace of mind while keeping your eyes wide open—and on the road!